It looks like we have about two more days of mild temperatures before the icy grasp of winter creeps in and kills our buzz. Its been a pretty mild November and start to December. A couple the shop guys were out yesterday and reported fairly productive streamer fishing. As the weather turns cold however you'll need to slow everything down. Look for water that is just slower than walking speed, slow down your swing, and make sure you are fishing very low in the water column. 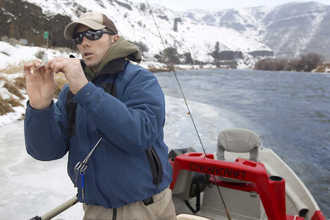 Winter fishing can be productive almost everywhere all over the country short of ice flow on the river. Trout have to eat. In addition, there are some things working in the angler's favor. The fish tend to be podded up in the obvious pools. Go slow, take your time, and fish your favorite spots in detail. Its quiet. Less road traffic, no float traffic, and white noise. You could here a pin drop on the river at times. Did I mention it gets cold? There are several ways that we need to tackle this demon. One is that you need to be smart about how you manage your day, expectations, and your strategies. The other part of it is having good gear. Here is a video that outlines a good layering system. Base Layer - Tight Fit, slick back. Under Armour is a good choice here. Wading Pants - The kind with the stirrup are very nice to have. The number one thing that keeps anglers from having fun and being effective in cold weather is... cold hands! Its very tough to have fun when you can't move your fingers, tie knots, and are just plain miserable. Get good gloves. Anglers should always bring two pairs of gloves. It just makes sense. You will often need to do things that get your hands wet! Like landing a large fish. Always bring two pairs of gloves. I personally like to have one set of wool half finger gloves all the time. I also like fold-over mitts when it gets really nasty, but when I am rowing, launching the boat, winching the boat up etc. I really like the Kenai Gloves from Simms. So maybe you need three pairs haha. Good gloves can be used for snowball fights, shoveling the driveway, or just being comfortable so its money well spent. Here are some of the gloves that we sell at Red's. Simms Freestone Half Finger Gloves - ECONOMICAL OPTION! Simms Skeena River Glove - WATERPROOF - Great for when you know your hands will get wet. You can actually spey fish with these on. Yes. Cotton kills. Sometimes literally. Wow, these sound really awesome.I get some helpful tips. Id love to try them!